North Mallow & Co.’s gourmet marshmallows elevate the humble s’more. Courtesy of North Mallow & Co.
After the toasting, get roasting! S’more bars are becoming a popular reception activity, and North Mallow & Co. is firing up some of our favorite ooey, gooey concoctions. Former camp counselor Mike Nelson was always passionate about his s’mores, and in the winter of 2013 he decided to make it his business. “The s’more has been made the same way time and time again, so I decided to bring another new twist to this classic favorite,” Nelson says. Nelson’s marshmallows are homemade with all-natural ingredients, and they can be sandwiched between two grahams with Ghirardelli dark chocolate, a Reese’s peanut butter cup and other chocoholic favorites. Marshmallow flavors like vanilla bean, caramel and mocha made with Caribou espresso leave everyone wanting s’more (sorry, we couldn’t resist). “Our s’more bar is more than just a dessert; it’s an interactive experience that guests of all ages can enjoy,” Nelson says. 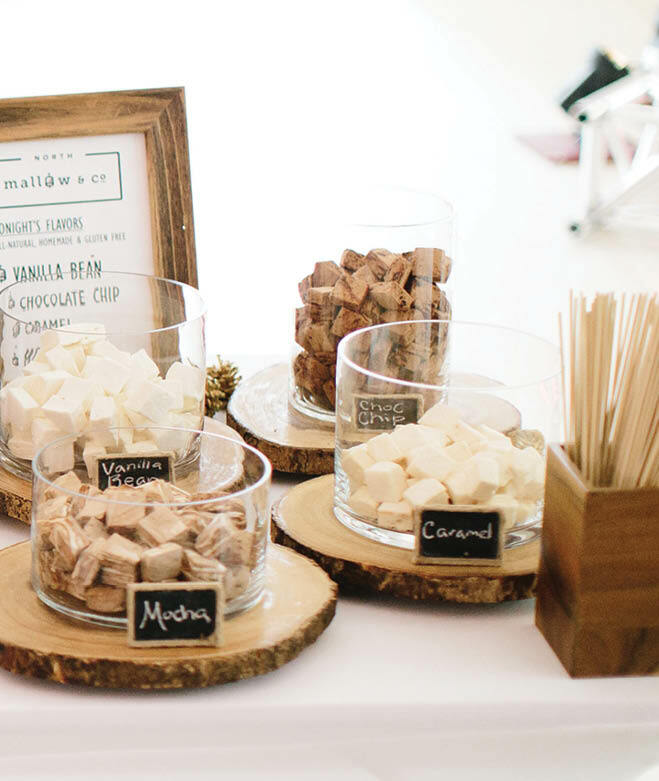 Besides the full-on s’more station, North Mallow’s fluffy treats also make great wedding favors and are delicious in hot cocoa to warm up guests on chilly nights.